I am an ephemera dealer and collector specializing in art deco graphics. The definition of ephemera, is “something that is not made to last,” like brochures, advertising and trade cards. However, ephemera dealers, like me, do the opposite. We collect and keep these historical documents so people remember them. I started this “hobby” 20 years ago with bridge tallies, bridge pads and art deco playing cards, all related to the game of bridge which I don’t play. But the graphics on them were phenomenal and there are thousands of different designs. I traveled frequently, particularly to Europe, and I was always looking, no matter where I went. I’ve sold some of the thousands of items I have found over the years, on eBay and at trade shows mostly, but I wasn’t in it for the money. It was all about the hunt. A number of years ago, I went to Amsterdam in search of inventory. In doing so, I went into an antiquarian bookstore and inquired if they had any original art deco graphics. The owner handed me a beautiful, colorful brochure that was made for the Department of Transportation for the City of Amsterdam. I asked about the artist and he told me her name was Fre Cohen. 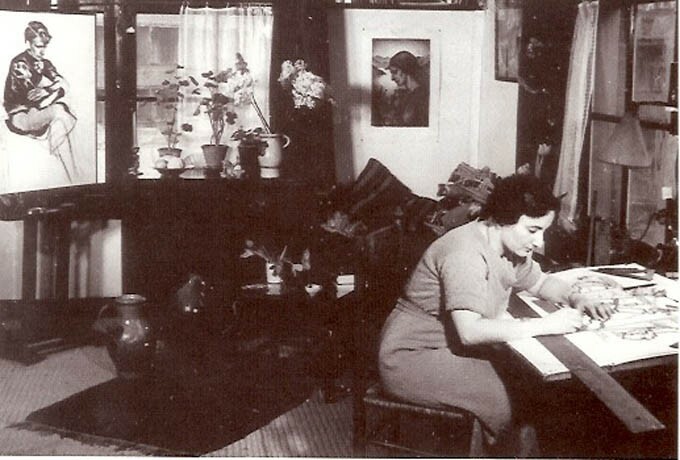 She was a young, Jewish, graphic designer and illustrator who died in the Holocaust. He also had a book about her, and even though it was in in Dutch, I quickly bought both the brochure and the book. Fre Cohen was born in Amsterdam, the oldest daughter of Levie Cohen, a diamond cutter, and Esther Sarlie Cohen. She always showed an interest in drawing, even as a young girl. She also grew up in a working class socialist family and was a member of the Workers Youth Center. Her first job was at Draka, a wire company, where she designed ads. In 1923, she got a job at the SA Development, predecessor of Workers Press. Here, she designed book covers, stickers, pamphlets and other materials. Fre worked in her own personal style, which was influenced by art deco and art nouveau. Mostly decorative and romantic, her style was also influenced by “Wendingen Style.” “Wendingen” was a very popular monthly architecture and design magazine, designed by H. Th. Wijdeveld. It had its own typographic style and was used widely in Holland from 1918 until 1932, when it was no longer published. Fre Cohen continued to use it until 1940. In 1924, when Cohen was 21, she started to take classes at the Quellinus Art School in Amsterdam. She graduated in 1929 with the first ever Medal of Honor. From 1929 to 1932, she was employed by the Stadsdrukkerij Amsterdam, the printing firm for the city of Amsterdam. Cohen designed the piece that I have while she was working there. She designed most of the common printing for municipal services. She was a very energetic and active worker, who also designed bookbindings, tickets, flyers, bookmarks, bookplates, birth and wedding cards, certificates, calendars, woodcuts, three-dimensional packaging and scale models. Fre also did portraits, posters, songbooks and advertisements for other companies as well as working for the city. Her appeal was charming and she was the most prolific female designer of pre-1940 Holland. She used photomontage, architectural ornament and arts and crafts. Cohen also designed her own font called FRECO. She alternated between all these modes and the others I have listed above. Her diversity was amazing. Her signature, Fre Cohen, or FC, can be seen on most of her work. Fre’s philosophy was that culture had to be part of the working man’s daily life. She was an idealist, who with art and simple expression could indicate the pursuit of freedom, self-fulfillment and a sense of community. Unfortunately, Fre Cohen had to leave Amsterdam to flee from the Nazis. She was hidden by friends in the country, but was betrayed. When she saw the Nazis coming, she took poison that she had with her and died in a hospital in Hengelo at the age of 39. Her sister survived her and she managed to save a lot of her work that wasn’t destroyed by the Nazis. The Stedelijk Museum in Amsterdam houses a collection of her work. Susan Warshaw Berman is a vice president of the board at Jewish Family Service and the author of “Affordable Art Deco Graphics” published in 2002.